Four very different women have an embarassing problem they're determined to put right! "I laughed out loud and missed my bus stop." The Goddess Workshop started life as a stage play which was performed for three incredible nights at the Cambridge Drama Centre. Later, I attempted a screenplay of it, and finally, I wrote it as a novel, which allowed me to do so much more with it. With so many versions of the story, I lived with the characters for a long time - laughing with them, caring about them, and experiencing their challenges, heartaches and triumphs. I loved that group of friends. I heard their conversations inside my head as I walked the dog, and I missed them so much after I'd finished the book. So I'm thrilled to be about to plunge into their worlds again, and to spend time with old friends. I wonder if any of you are about to plunge into some writing? To travel to that place where you're so submerged that magic happens frequently inside your head - plot points clicking together, story strands joining up satisfyingly, characters acting in ways you'd never even thought of, but which are so very right for your story. This is the writing zone, where there is no procrastination, no trouble using every available piece of time to write, no worry about what others will think about your words. A place where your inner critic can be ignored. A glowing place of creativity and self-fulfilment. It's where I hope to be for the rest of the year, and it's where I hope you will be too, if you want to write. But if you're finding it difficult to imagine yourself there, or you're trying to reach that place but it isn't working for you,why not enrol for my course FEEL THE FEAR AND WRITE ANYWAY, which I designed to help you to overcome blocks to your writing, to boost your writerly self-confidence and to help you really move forward with your writing goals. You can find out more and enrol HERE. Happy writing! 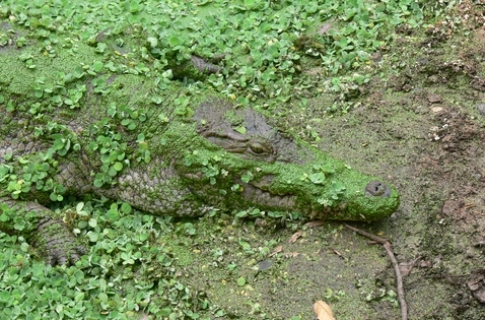 I'm off to a Sacred Crocodile pool in The Gambia. Posted in Feel The Fear And Write Anyway, My Writing Adventure, Women's Fiction. Tags: challenge, confidence, creative writing, creative writing tips, Feel The Fear and Write Anyway, humor, humour, The Gambia, women's fiction, writer's block, writing, writing success on October 31, 2016 by Margaret K Johnson.